CRIPPLING INFECTIONS AND yield losses from the aggressive fungus, Fusarium graminearum, continues to be a real threat to Ontario corn and wheat growers. For the first time, a team of researchers has put together a set of baseline data that they believe will help track which types of Fusarium are present in Ontario fields, as well as how these different Fusarium populations are distributed. Fusarium graminearum is the main pathogen responsible for causing Fusarium head blight (FHB) in wheat and ear rot in corn. The fungus produces several mycotoxins, including deoxynivalenol, or DON, that contaminates crops and reduces grain quality. To help growers manage the amount of DON being produced in their fields, researchers first need to get a better understanding of what types of Fusarium strains are present in Ontario and how these populations are growing and shifting with each passing growing season. A new study, led by Dr. Rishi Burlakoti, Research Lead at Weather INnovations Inc., has been taking a closer look at the types of Fusarium strains found in Ontario corn and wheat. “What we’ve done now is establish a baseline to monitor Fusarium populations in corn and wheat on a much larger scale in Ontario,” he says. Burlakoti worked in collaboration with Dr. Lily Tamburic-Ilincic and Research Associate Victor Limay-Rios from the University of Guelph, as well as Agriculture and Agri-Food scientist Dr. Rick Peters. First, Burlakoti and the research team analyzed and isolated a large collection of more than 500 F. graminearum strains from common corn hybrids and wheat cultivars collected at 32 locations in Southwest, Central and Eastern Ontario. Next, the research team used molecular markers to pinpoint each Fusarium strain’s exact genetic profile. Fusarium strains in Canada commonly express one of two different chemotypes: 3ADON or 15ADON. Burlakoti says the number of Fusarium strains that produce 3ADON have been reportedly increasing in Western Canada and the Atlantic Provinces in recent years and are believed to infect grains more quickly than strains that produce 15ADON. The 3ADON chemotypes also produce higher quantities of DON mycotoxin than 15ADON types. What they found from the strains they collected was that more than 95 percent of the Fusarium corn and wheat strains they collected in Ontario were 15ADON type, while the more toxigenic 3ADON chemotypes were found in very few locations. He points out that Fusarium is also seed borne, meaning that fungal strains can be spread among the provinces through seed trade. 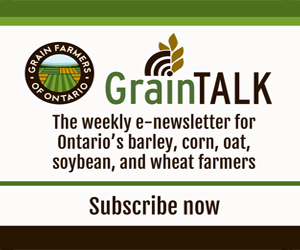 The fact that 15ADON Fusarium chemotypes found in Ontario appear to be less toxic may also play a factor in Ontario’s seed trade policy with other provinces going forward. But for the moment, Burlakoti says that he and his team do not have a concrete answer as to why the Fusarium chemotypes in Ontario are unique to the rest of Canada. However, being able to pinpoint and stay on top of a Fusarium population’s movements is easier said than done. Burlakoti explains that many factors – including the presence of a particular Fusarium strain, weather, agricultural practices and crop genetics – can each influence whether growers will see higher or lower incidences of Fusarium head blight (FHB) or ear rot. Fungal populations also tend to change and adapt to new environments and may produce different levels of mycotoxins. Ideally, Burlakoti would like to see the Fusarium population in Ontario monitored every two to three years, as well as populations outside of Ontario, to better understand what circumstances lead to shifts and changes in distribution. That way, Fusarium-resistant corn and wheat breeding programs would be able to breed resistant hybrids and cultivars suited to specific geographies, regions and provinces. Burlakoti points out that having data on the size and distribution of Fusarium fungal populations will also help in evaluating risk for Ontario food safety development and improve the ability to forecast pre-harvest FHB. “You need to be able to monitor the different chemotype distributions over time and across geography,” he says. “This way, we will be able to plan and deploy strategies in managing Fusarium diseases in wheat and corn and reduce the amount of mycotoxin contamination in grains,” he says.